MRI-March 2015 - Adventures with the Tuleys! Late night and early morning! I woke up with Josiah at 3:30 this morning to give Josiah his medicine and give him one last chance to eat and drink. He did eat, and thankfully was okay with going back to bed around 4. We were up again at 5:30 to get ready and be at the hospital by 7. Josiah kept asking where we were going. He hated the answer, “to an appointment.” He really hated it when we put the numbing cream on his arms because he knew exactly what appointment it was. That was really sad and very hard to do. 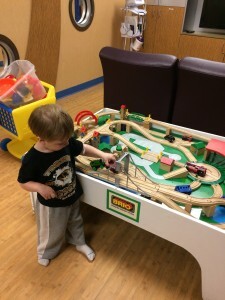 When we got to CBCU (cancer unit), Josiah was still pretty happy, wanting to play with the toys. 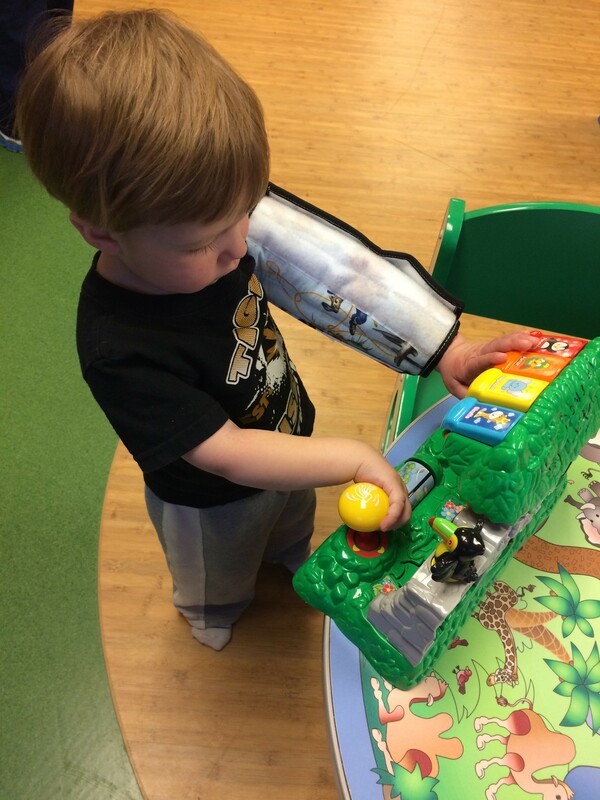 In fact, to get him out of the waiting room and into an exam room, we had to bring a waiting room toy with us! He still wasn’t thrilled with getting his vitals and taking his shoes off to weigh and check his height. He’s up to 26 pounds! Josiah was able to play in the toy room for a little bit before having to get his IV put in. He seemed to enjoy all the toys. 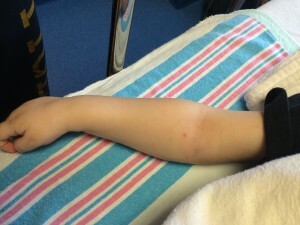 He did really well with the IV, especially considering they had to put it in his left arm. The child life specialist had an iPad for him to play on, and he did an excellent job using his right arm -without complaining- as they drew blood and secured the IV. He was not happy to have his arm straight and secured, and continued telling us he wanted it off. I simply told him he would have to ask the doctor. So when the rehab doctor came in, he walked to her and said “Doctor, I want it off.” Unfortunately for him, it didn’t work. The sedation process started at 8:30 and went pretty well. He was sedated in the CBCU this time around because he was getting Botox shots into his right arm. The Botox will help relax the muscles in his right arm and allow for easier therapy in the hopes it will help build up the muscle and give him more control of his arm. This is the major reason we have increased his weekly therapy. The Botox will take 2-3 days to take effect, and will be in full effect in about two weeks. After that, the relaxed muscles will last for about 3 months, giving us plenty of time to work and stretch the muscles. 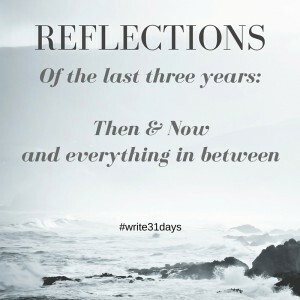 We’re hoping for great progress! We were able to stay in the room for the Botox shots. There was an electric stimulator that attached to the needle on the syringe that contained the Botox. When they inserted the needle into his arm, they turned the stimulator on and it would send an electric impulse to his nerves, causing muscles spasms, to ensure they placed the Botox in the correct muscles. When the Botox was completed, his oxygen dropped a little bit, requiring a mask for a short period of time. Once they readjusted his chin and head, he was able to breathe better, and he didn’t need the oxygen for the rest of the time. We then walked down with him to the MRI room. 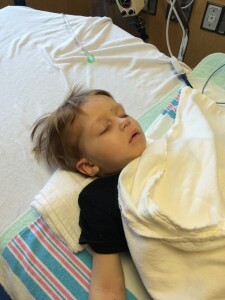 We waited in the waiting room until he was done, then went back to CBCU to wait for him to wake up. He slept for about an hour, which was a little longer than he usually does. He was given a separate sedation medicine during the Botox shots, which was likely why he slept longer. Josiah was not real happy when he finally did wake up; still wanting the IV out of his arm. He was complaining of it hurting. He took a few drinks of chocolate milk, then the nurse took the IV out since it was bothering him so much. He was more upset while getting the IV out than he was when it was put in. Tearing that tape off is brutal! We’re going to try something different next time, because his skin is so sensitive to the tape. We had to stay for a little while longer, and he finally calmed down enough and wanted to play in the toy room. He found the trains and when he was cleared to go, he was wanting to stay! We were finally able to coax him into leaving, and he blew everyone kisses as we left. We got back home around 1:00, where our other kiddos and my parents were waiting for us. Josiah was happy to see them all. Nathan had taken the day off, so he was home with us as well! Not long after my parents left, we got a call from the nurse and she told us that Josiah’s MRI looked fine and everything looked great. Such wonderful news to hear! We had a good rest of the day; the kids played outside with Nathan and we ended with a movie night and Josiah climbing up to snuggle in my arms and falling asleep. Thank you to everyone for your continued prayers and love. 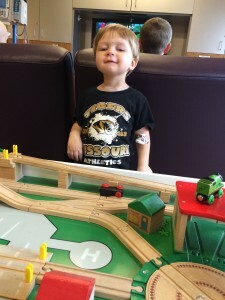 Josiah’s next MRI is scheduled for June 3rd. So glad to hear the MRI results were good! I love reading Josiah’s comments about what is being done. He’s really asserting himself! Pray the Botox therapy works and great progress will be made. He’s such a cutie.